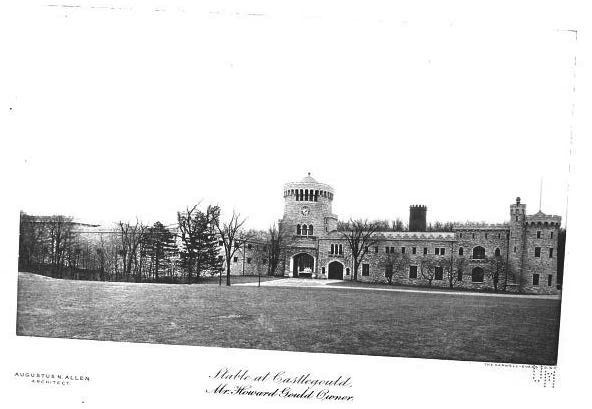 'Castlegould', the Howard Gould stable designed by Augustus N. Allen c. 1902 in Sands Point. Click HERE and HERE for more on 'Castlegould'. Photo from The New York Architect, 1907. 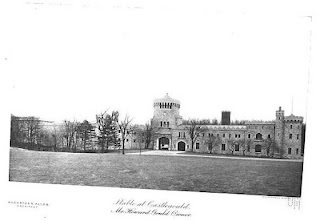 Are those stables still functional at all (a la Caumsett) or long since discontinued when it became part of the Sands Point Preserve? Is there any news if there was damage to the gardens of Old Westbury House? Germaine to nothing with today's Castle Gould, but last night two shows were on nationally with the Gold Coast: Turner Network Classics aired The Great Gatsby (quirky but certainly great to see again) and the tv show, Gossip Girl, featured an equestrian event set at one of the Old Westbury stables listed on 'The Location Company' site. The property was sold to the US Navy during WWII and the stables likely lost their functionality at that point. @Kellsboro Jack: Gossip Girl has filmed at OWG, and Orchard Hill in past seasons. This season's first episode was filmed in Carle Place, a scene at the drive through deli on Westbury Ave...fun! The second nicest private estate left intact in Old Westbury (Erchless being the first). The stable is beautiful (and the current owners have a lot of horses). The 'Groton Place' Stables (which was the only structures seen) has such a lovely center building. Very distinctive and pleasing.